Have you ever felt powerless to change any particular situation in your life? Ever felt “singled out and picked on” by somebody else? Do you sometimes feel like a victim? Do you often feel that you have so much to offer in yourself, but scared to let yourself shine? How about feeling happy with what you do in life as expressing your special gift? These are some feelings and behaviors that are associated with having a blocked Solar Plexus Chakra. The Third, or Solar Plexus Chakra is also known in Sanskrit as Manipura. It is the third most physical of our chakras, and also vibrates at the third from the lowest frequency of all our main chakras. The Solar Plexus Chakra also governs our kidneys, liver, digestive system, spiritual growth, and personal expansion. Symbol for Manipura has ten petals which match the vrittis of spiritual ignorance, thirst, jealousy, treachery, shame, fear, disgust, delusion, foolishness and sadness. Little by little, the illusions of fear, doubt and powerlessness get peeled away, and the REAL You gets to shine through. Feel the joy in that, and become comfortable in your own power. You are extraordinary, and you deserve to shine. There is nobody in the whole world just like you, so let yourself shine for all Creation to see. Bone broth is extremely healthy for your digestive system, which your solar plexus chakra governs. Click the image to shop for organic bone broth – a yellow-golden superfood! Balance your Solar Plexus Chakra that influences your identity, personal power, and sense of self-worth. Imbalances can take on polar opposites ranging from low self-esteem to arrogant, selfish behavior. The Solar Plexus Chakra is located approximately 1-2 inches above your naval, its color is yellow/gold, and its element is Fire. This chakra is the center of your personal power and thoughts. When we have gained the “will power” to choose our thoughts, and therefore our behaviors, actions, words, and attitudes, we are consciously in control of our life. On the other hand, if our thoughts, behavior, actions, words, and attitudes are not consciously chosen, then we are reacting rather than responding. Then, we do not feel like we are “in control” of our life because we are unable to choose a response that empowers us. The Solar Plexus Chakra represents our third dimensional consciousness, and it is also ultimately the gateway to our fourth dimensional consciousness on the Astral Plane. The third chakra represents the struggle of the currently incarnated ego system, first with ourselves and others as described above, and then ultimately with our Soul, or Higher Self. When we find our power within ourselves, we no longer need to struggle against others. Then, our ego must learn to recognize the still, small voice of our Soul and the little “i” must learn to surrender control to the greater “I”. When the Solar Plexus Chakra is balanced, you are confident and empowered with a healthy level of self-esteem. You have respect for yourself as well as the respect of others. You have a strong sense of self and your personal power and you use it responsibly. You are a good decision maker, skillful and intelligent, and are most likely doing what it is that you were meant to do in this life. You are outgoing, cheerful, expressive, and eager to take on new challenges. You live consciously. Your power struggles with others are minimal because you accept responsibility for the creation of our own reality. Therefore, you do not feel victimized or controlled by others. The Solar Plexus Chakra rules the pancreas, stomach, liver, gallbladder, and spleen so when this chakra is out of balance, you may experience problems with these organs and with digestion. When there is excessive energy running through this chakra, you may be judgmental, domineering, a perfectionist, overly intellectual, uptight, and a workaholic. When the Solar Plexus Chakra is blocked, you may lack confidence and have low self-esteem, lack direction, have confused thinking, be indecisive, and constantly worry about what others think. In addition to the chakra clearing and balancing meditation, there are several ways that you can focus your energy and intention on balancing and clearing the Solar Plexus Chakra. Connect with the mineral energies of citrine, yellow or gold topaz, tiger’s eye, amber, and gold. Use spices that are warming and aid digestion, such as ginger, peppermint, turmeric, cumin, and fennel. Drink ginger, peppermint, or chamomile tea. Gift yourself a sunflower. Practice exercises that strengthen the core muscles. Become aware of your thoughts, particularly those you have about yourself, and consciously choose to transform negative thoughts into positive ones. Begin a meditation practice, if you have not done so already, in order to still the mind of the ego in order to hear the voice of the Soul. Realize that you are your own Creator, you are the Architect of your reality, and as such you are the most powerful person in your world. frankincense, roman chamomile, rosemary, black pepper, lemongrass. To balance your Solar Plexus Chakra that influences your identity, personal power, and sense of self-worth. 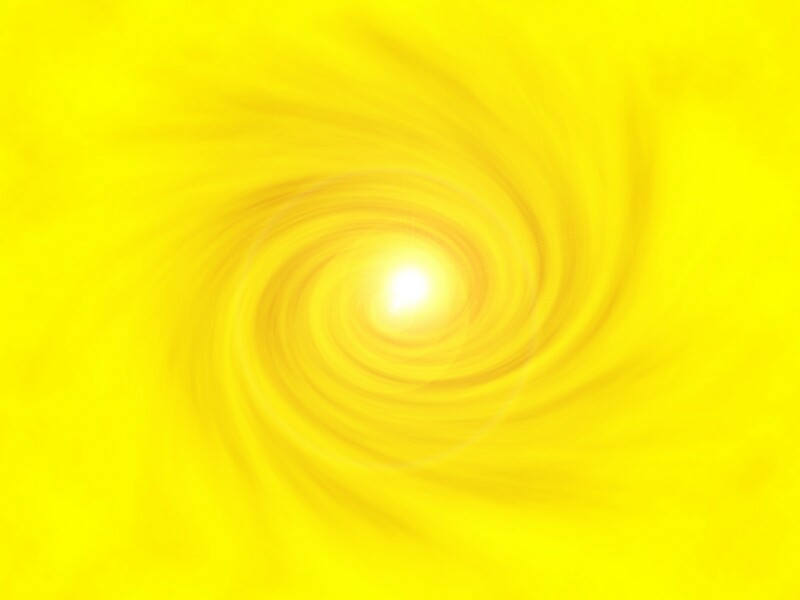 Take a moment to clear and energize your Solar Plexus Chakra. While looking at this image, bring your attention to your solar plexus area in your body. This is located under your sternum, at the top of your belly. Allow yourself to feel your presence there, paying attention to all the sensations. I shine more brightly than the sun. It is easy for me to relax. I release all anger and resentment. I let it go. Breathe into your solar plexus area. Breathe in these affirmations as you say them out loud. Breathe out all fear, anger, resentment, jealousy, rage, hatred, and anxiety. Breathe in Power – Love, Joy, and Peace. Breathe out all darkness. Breathe in confidence. Breathe out cheerfulness and imagine the circulation of that cheer, out to all others, as you have so much to give. As you are empowered, so are all others. Use your True Power to remind those around you of their own True Power.